Step to Success: A step to your success is anything that moves your life and your business forward. Whether it’s an app, a book or an idea, you can apply something today that can help you succeed. Today’s step to success offers sweet savings in the form of a Chrome browser extension called Honey. Dancer’s Dialect: The Dancer’s Dialect is the dancer’s language. I share dance terminology and concepts across different genres so you can see correlations in your life and in your business. Today’s word is expressionist dance from Germany. I thought it appropriate to share since my feature presentation focuses on a duet of German dancers. Freestyle Flow: It always cracks me up when people are on the phone in a public restroom. My quick judgement taught me a lesson on acceptance and finding common ground. Feature Presentation: The first of four performances I was privileged to experience at The Odyssey cipro 1g Theater provided much introspection on various topics. These are the lessons I learned from watching “Eifo Efi” choreographed and performed by Ioannis Mandafounis and Fabrice Mazliah. Try not to talk over a person during a conversation. It’s not always avoidable but something to work on. Pay attention to and assess the dialogue going on within yourself. No judgement, but awareness. Silence and stillness are not always a bad thing. Take breaths when necessary. 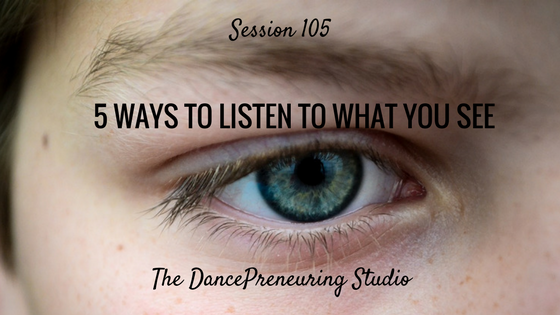 Question: How can you listen to what you see?